HEi-know speaks to Jane White, who has taken up the role of Executive Officer at AUDE (the Association of University Directors of Estates) following four years as Head of Research and Information Services at IOSH (Institution of Occupational Safety and Health). Q. 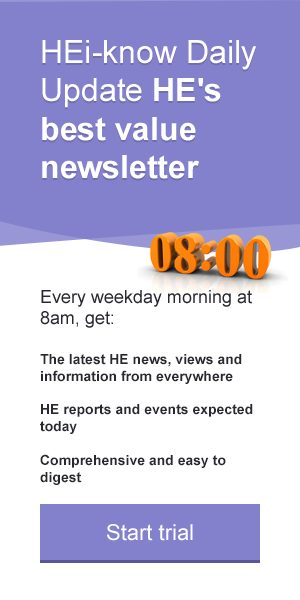 What do you see as the key challenges facing university estates now? "The university sector has faced many challenges over the past year and we now find ourselves in an ever more competitive market. Our recent AUDE Higher Education Estates Statistics Report 2015, details the challenges and impacts of the estates of the higher education sector. The sector has a total income of £28 billion (an increase of £1 billion from last year’s report), which is the equivalent to the annual spend of the Department for Business Innovation and Skills and eight billion more than the annual Government spend for Northern Ireland. "At present the pool of available students is decreasing, and will continue to decline for a further six years before the number of 18 year olds starts to rise again. Institutions are now able to set their own size and recruitment objectives and attracting UK and overseas students will continue to be an important part of some institutions’ strategies. "The student experience is inextricably linked to the quality and effectiveness of the estate. Protecting capital spend and persuading governing bodies to continue to invest, is going to require careful thought and debate so that inward investment continues and the estate remains on the agenda for all nationwide institutions." Q. Tell us something about your new role, and how AUDE will be helping the sector respond to the challenges it faces? "With over 10 years’ experience managing estates at Leicestershire County Council, I am absolutely delighted to be starting my new role at AUDE and bringing my experience in research and development, to the post of AUDE Executive Officer. "The work AUDE does is especially important when taking into account the ever changing Higher Education landscape. Tuition fees have trebled and students are now expecting more and better value from their university experience. There is also flat lining income for Estate Directors to take into account. In this environment, I will play a critical role in organising, promoting and showcasing industry best practice especially around driving efficiency, increasing commercial income and saving money whilst improving services. "It’s great to see the sector continue to thrive despite funding challenges and the trebling of tuition fees. Improving the student experience with excellent, well-maintained facilities is at the forefront of AUDE’s goals and maintaining attraction will continue to be a key area of focus. "In April 2016, we will be hosting AUDE’s annual conference that will discuss the main issues facing the sector in Higher Education. As AUDE Executive Officer, organising the yearly event will be one of my key focuses, alongside supporting university directors of estates in developing and maintaining strategic plans. "One of the conference highlights is finding out the AUDE award winners. The Awards are an excellent opportunity to showcase sector achievements and allow everyone to learn from knowledge of the very best practice taking place in our institutions today. If anyone wants to enter there is still time. The deadline for all award submissions is 31st January 2016.